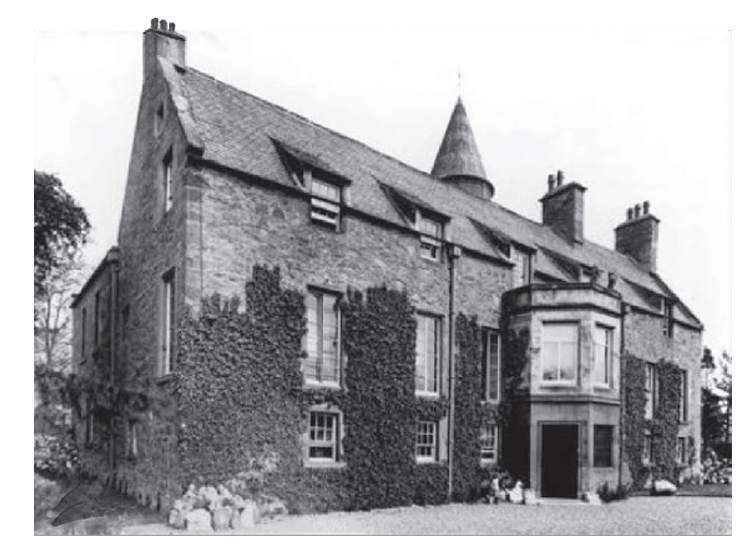 Blackness House always was an imposing place, situated to the west of Dundee, at the junction where the main roads from Coupar Angus in the north and Perth in the west join. 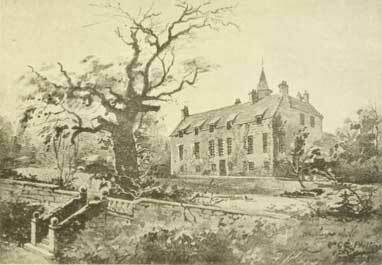 The old toll house was there and from the 1600's, the Barony of Blackness, was owned by the Wedderburn family. The Wedderburns and the Hunters were good neighbours from long time back. They had purchased both, Balgay and Logie, from the Hunters. The Hunter name appears as witnesses on some of their charters, weddings, marriages and births; even once as a God-father and mentioned as executor on a will, entrusted with the tutoring of a child-laird until he came of age. 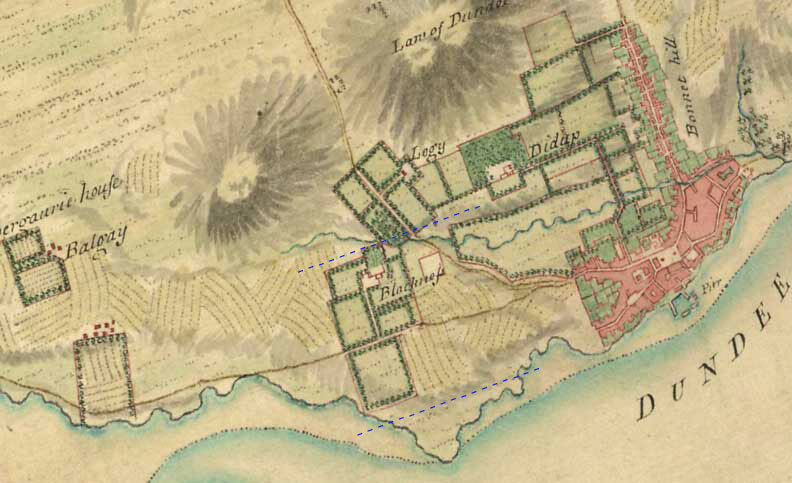 In 1741 Blackness Estate was put up for sale at public auction. The succesful bidder was Alexander Hunter of Balskelly, with entry at Whitsuntide 1742. Whether Alex. bought the estate for it's beauty, or as an astute purchase in the property market, we'll never know; but Dundee was about to hit the big time. The late 18th - early 19th century saw Dundee expanding at a rate of 30% every 10 years. It wasn't long before there were lots of buyers looking for a piece of Blackness. Alexander Hunter, 1st of Blackness, 2nd of Balskelly, and of Eskmount, must have been a real glutton for punishment. He had just married the year before and until his family, came of age, he was on his own. There would have been loads of experience on the Hunter network, but his holdings were quite scattered and complicated. Apart from two estates with mansion houses, he must now have owned about eight farms and more than thirty houses both for workers and rental. 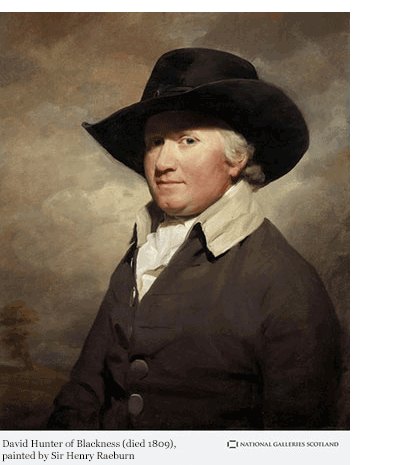 Alexander's firstborn was, David Hunter, 2nd of Blackness, 3rd of Balskelly, junior (1743 - 1809). He was to become the mainstay of the family through to the next generation. The start of the new town Carnoustie was one of David's projects, as mentioned on the Balskelly page. He also owned both sides of the main road from Barry to Monifieth about 145 acres in total. Both projects, (just my thoughts) seemed to lack slightly in commitment, possibly just too many things going on. Keeping up with the modern trends, in the 1790's David also had a "town" house in Edinburgh at 21 George street, for socialising and business. 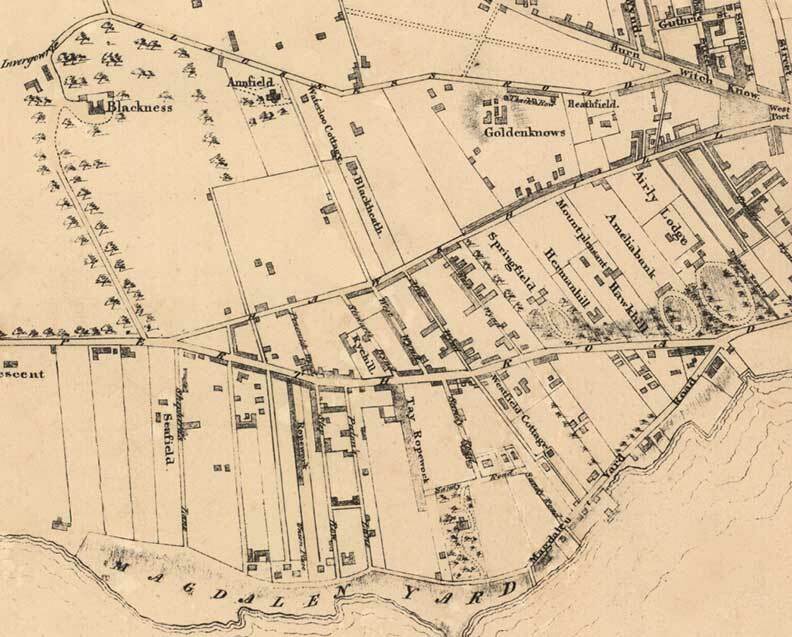 In 1794, on one of his early land transactions, he was renting out (feueing) 6 acres at Magdalen Green in Blackness, the contract was drawn up by two clerks from Buchan, Hunter & Co., Merchants in Edinburgh? Buchan, Hunter & co., traded in Edinburgh around 1793-98 then separated, the Hunter side carried on as Messrs., Hunter and Co., Woollen Drapers in Edinburgh. What relationship or who was behind them I have yet to discover. All this travelling in a time before trains and engine powered boats. David must have managed some time at home, he had twelve children and futures aplenty waiting for them all. David died in 1809 at Eskmount, he is buried at Brechin Cathedral. Alexander Gibson Hunter, of Eskmount and Loretto W.S. (1770-1812), David's eldest son, who was pursuing his own interests in Edinburgh and London, returned to Blackness to manage affairs. Alexander G., was a Writer to the Signet and from his life experiences was probably the best guy to take control at this time. He drew up a trust fund for all the properties; to the benefit of family members into the future. Unfortunately however he died, three years later, aged 41. Alexander G.'s first son, was David Hunter, of Blackness junior (1803-1882), he succeeded to his father at the age of 9. When he came of age there would be a lot of sorting to catch up on. From the History of Dundee, book 1842: "To these evidences of the thriving state of Dundee and indeed of the whole neighbouring country a variety of others might be added. In 1772 no more than five or six houses were to be seen between the west end of the royalty and Blackness. Now upwards of 100 acres have been feued out in the same district for building on and upwards of 4000 people settled in it." 1843 [advert] "Valuable Feu-Duties and Casualties of Superiority for sale ~ one lot, all and whole the feu-duties and cas. of superiority of the lands of blackness, lying within the new extended Royalty of the burgh of Dundee. the fues are about 65 in number and yield ...."
1844 - 1853 Balskelly and Eskmount were sold. 1847 [advert] "Dundee, June 24, (Not to be repeated.) SALE HOUSEHOLD FURNITURE, WINES, &c, AT BLACKNESS HOUSE, BELONGING to DAVID HUNTER, Esq.,— Consisting of— GRAND PIANOFORTE; EIGHT-DAY CLOCK; CHEST of MAHOGANY DRAWERS and BOOK CASE ; ANTIQUE ..."
"Magdalen Green, over 20 acres in extent, is on the bank of the River Tay, and at one time formed part of the estate of Blackness, held by the Wedderburns, and afterwards by the Hunters. It is supposed that the name was derived from a Chapel dedicated to St. Mary Magdalen, which is said traditionally to have been at the foot of what is now Step Row. After the Reformation the ground was secularised with other ecclesiastical property, and handed over to the Town Council; but up till quite recent times the Laird of Blackness, Mr David Hunter, claimed that he had control of all this space, as the bound of his Barony was the river, maintaining that Magdalen Green, formed part of the lands of Blackness. Much litigation ensued between the Town Council and Mr Hunter but eventually a compromise was made, and he received £1,500, and the Green became the absolute property of the Town Council. 1867 J. B. Brechin, published a list of paintings of old masters in Blackness House gallery, including: Giotto, Bruegel, Gainsborough, Rembrandt, Raphael, Rubens and Titian..
Around this time David must have been spending most of his time in Edinburgh. 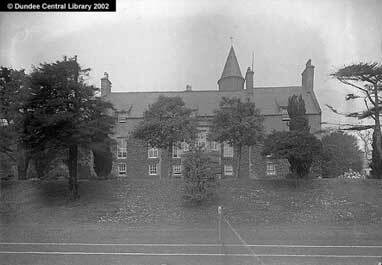 1871 The Commissioners of Police purchased the pasturage at Magdalen and in 1875 David gave up rights to foreshore. 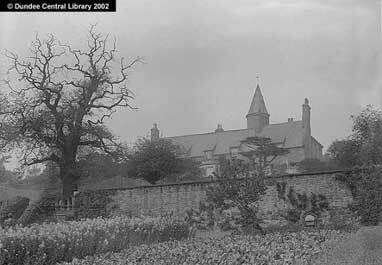 1872 Landholding: David Hunter, of Blackness, reduced to; Dundee 98 acres and in the Town of Dundee 20 acres. 1872 David Hunter of Blackness married at the age of 69, to Margaret Mathieson, who was 25, at St. Giles Cathedral in 1872. They lived at 15 Lee Crescent, Portobello, Edinburgh. From the union a successor was born, Alexander Gibson Hunter of Blackness (junior). Closely followed by three other sons. 1882 David Hunter, Esq. of Blackness J.P., at 79 years of age died in Portobello. He was buried on the 13th January 1882 at Greyfriars Kirk in Edinburgh. Alexander Gibson Hunter of Blackness, died 2nd Feb. 1898, aged 27. He was succeeded by his brother, David Hunter of Blackness, born 1873. 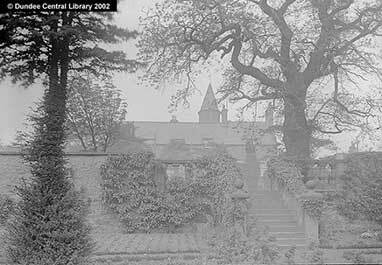 1924 The estate and mansion at Blackness were still owned by the Hunters. Blackness House was demolished in the 1930's. Map from 1750 showing the relative sizes of Blackness to Dundee, also shown are the Balgay and Logie Estates. 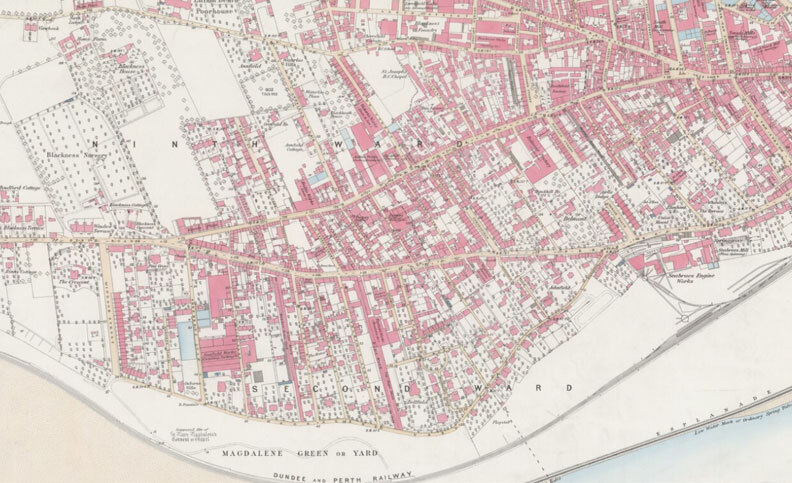 Blackness map 1820, estate reduced to almost half the size. 1850 showing expansion of Dundee, almost overrun Blackness.